Lars Doemer is working for Environment Responsible - Global Production at H&M. His area of expertise includes EHS, sustainable textile production, environmental product and process optimization, compliance management. Dr. Arvind Kumar Asthana is an Energy Expert with the Bureau of Energy Efficiency and is a Senior Technical Specialist for the Indo German Energy Program. Previously he has been Director of the National Cleaner Production Centre and the Energy Management Group at the National Productivity Council. P.S.Narayan has been instrumental in the creation of Wipro’s sustainability initiative. He has nearly twenty years of cross-disciplinary experience in consulting, business development, design and implementation of Enterprise IT systems and most recently, in Corporate Sustainability. Dr. Koshy Cherail has over 22 years of experience in program implementation, policy analysis and consulting with various bilateral and multi-lateral organizations, including World Bank, USAID and GTZ. He has been associated with various efforts to organise the ESCOs and Energy Efficiency businesses in India, which has culminated in the formation of the AEEE in 2008. Kamal Meattle is the CEO of Paharpur Business Centre & Software Technology Incubator Park. An entrepreneur with more than 40 years of experience in packaging, paper, chemicals, service and real estate industry, Kamal is an environmentalist by nature. Pranshu Singhal is currently working as the Head- Sustainability at Nokia India Private Limited. He has been working with Nokia in multiple focus areas for more than a decade and is currently focusing on issues like sustainable consumption and e-waste management for the company in India. 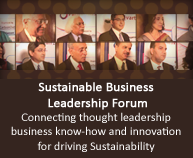 Premkumar is currently the Head- Sustainability at Cognizant. He holds 18+ years experience in global outsourcing services industry. His areas of expertise includes strategy, business analysis, change management, BPM, transitions, governance, business development, people practices, sustainability, carbon management and, Green IT. At Intel, Sonia is responsible for crafting and driving Intel’s CSR strategy and programs across South Asia as well as new and evolving areas around energy and environment. Prior to joining Intel, she headed CSR at Moser Baer and ABB and was also responsible for the formulation of the South Asian Forum for Responsible Business. Dr. Prasad Modak has worked with almost all key UN, multi-lateral and bi-lateral development institutions in the world. His work on environmental management over the past three decades has influenced environmental policies, investments and practices on a global basis and has led to building implementation capacities of key environmental institutions.